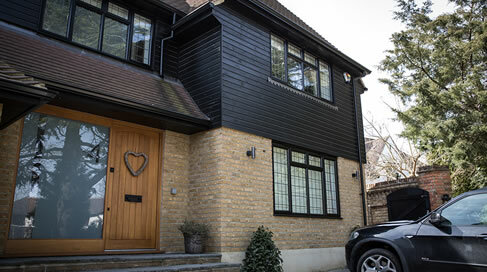 The home of seamless aluminium guttering. Gutters4u is an energetic business offering the supply and installation of aluminium guttering, fascia, soffit, aluminium liners for concrete gutters, down pipes and cladding to clients throughout the south east of he UK. The company, which is located in Essex, has a team of expert fitters offering a wealth of experience in the installation of quality aluminium roof line systems. All our staff are highly professional and strive to offer quality workmanship at a great price. For more information on the products that we supply and install, head over to our products page for images, dimensions and RAL colours for each of the goods that we stock. We are always adding additonal lines. Feel free to get in touch for any of your aluminium roofline needs. Gutters4u repair, supply and install a variety of aluminium rooflines. We specialise in 5 & 6 inch OGee seamless aluminium guttering. This system allows us to feed aluminium through a forming machine on site. It results in up to 30 meters of continuous gutter lengths with no need for joins every 3 meters. This means we can create gutters bespoke to your property. With minimal joins, powder coating in a selection of colours & internally hung brackets. The results are long lasting, durable and attractive. In addition to this system we offer cast aluminium gutters in a selection of profiles, gauges and RAL colours. For more information on the rooflines we install, head over to sit our products tab! Gutters4u have the perfect solution to problematic leaking concrete gutters and valleys. Our team will arrive on site and fabricate the exact profile of the gutter in a 'one piece' sheet of aluminium. Once installed the gutter liner will deal with the rainwater efficently and remove the problem of the concrete absorbing and leaking.